Leveret fourth album ‘Diversions’ launch tour 2019. 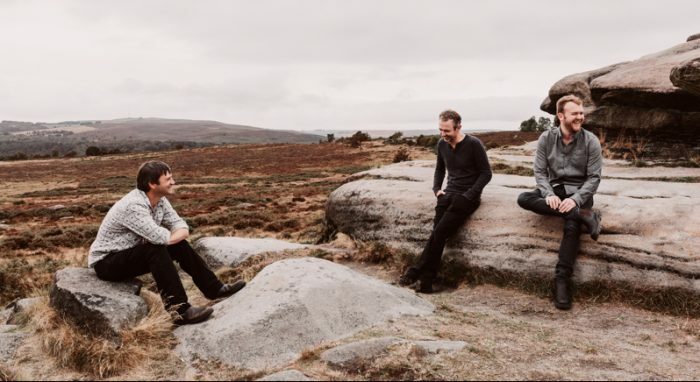 In an era where many artists are turning to one-off projects and crowd-funding to buck the trend of declining album sales and fewer gigs, Leveret stand out as being a band for whom gigging and recording together is the core of what they do. They have toured the UK countless times, established a following in Europe over several visits and recorded four self funded albums without a producer in sight. Their success is not just down to their individual mastery as instrumentalists, but also to the incredible musical bond they have formed and their distinctive style of playing together which eschews fixed arrangements in favour of spontaneous settings and adaptations of their material. A diversion can be an enjoyable pastime, a variation or detour or a piece of entertaining music. These diversions were recorded live over three days in September 2018 in an oak framed studio in Kent, with the three musicians in a triangle beneath two antique ribbon mics. Some of the tunes had been in the band’s repertoire for a while but others were very new, having been played only once or twice on tour in the preceding days and with fundamental questions like key only decided in the moment of the take. This sense of play and spontaneity is a vital element of Leveret’s sound and this set of upbeat and uplifting instrumentals show it off in the best way possible. Leveret are a remarkable band who genuinely love playing together; yet all three of them are incredible musicians in their own right. Fiddler Sam Sweeney was the 2015 BBC Folk Awards Musician of the Year, directs the National Youth Folk Ensemble and is known for his work in Bellowhead and The Full English, and his new solo album The Unfinished Violin. Melodeon genius Andy Cutting, a four-time BBC Folk Awards Best Musician, is a compelling solo performer and works with Blowzabella, Topette, June Tabor, and Roger Daltrey. Concertina wizard Rob Harbron leads the English Acoustic Collective summer school and is known for his work with The Full English (Best Group and Best Album BBC Folk Awards 2014), Emily Portman, Emma Reid, and Jon Boden. Individually they are among the best instrumentalists in England; collectively they are an amazing ensemble who combine thrilling musicianship with a warmly engaging presence.